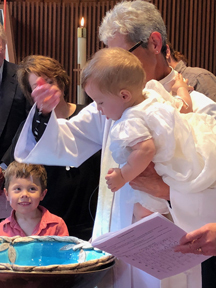 Baptism is the sacrament through which, by water and the Holy Spirit, we are initiated into, and become part of, the Body of Christ, the Church. We are adopted as God’s child and “marked as Christ’s own forever” as we affirm what is already true: all people are God’s beloved children. 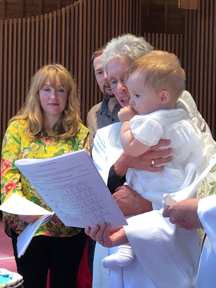 At our baptism we promise to continue in the Christian life, to proclaim the Good News of Christ, to seek and serve Christ in all persons, to love our neighbors as ourselves, and to strive for justice and peace. 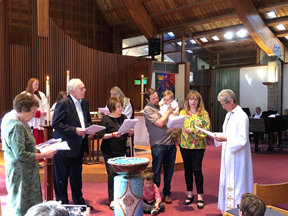 At Church of the Resurrection we celebrate baptisms four times per year, on the primary feast days: The Feast of Our Lord’s Baptism (January), Easter Vigil, The Feast of Pentecost and the Feast of All Saints (November). Other dates are available by special arrangement. Those who are seeking baptism for themselves or a child should contact the clergy.